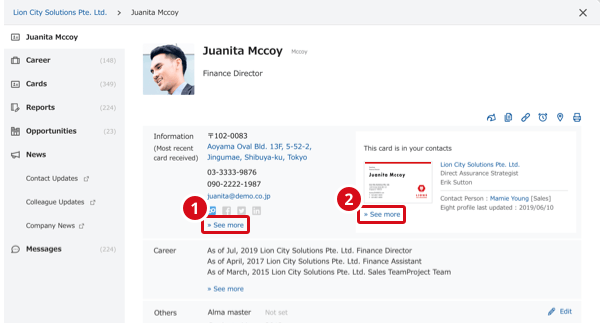 Here we will show how to access the Business card details screen, which displays detailed information about the card such as the company name and name. There are two ways to access it. 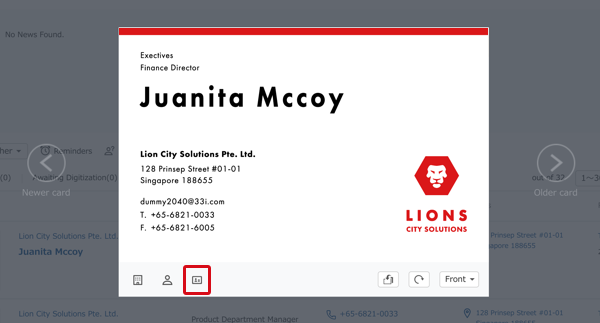 Enlarge the image of the of the business card from the Business card list, and then click on the Business card icon to display it. From the Business card list, click on Name, and you can access the Details about this person screen. 1. The most recent business card from My data and other people's data will be displayed. 2. The My data business card will be displayed. *If you do not have this business card, the following message will be displayed. "You haven't met this person."